234 pages | 12 B/W Illus. In recent years, smart specialisation has been a key building block of regional economic and development policy across the European Union. Providing targeted support for innovation and research, it has helped identify those areas of greatest strategic potential, developing mechanisms to involve the fullest range of stakeholders, before setting strategic priorities and using the policy to maximize the knowledge-based potential of a region or territory. Governing Smart Specialisation contributes to the emerging debate about the role of the ‘entrepreneurial discovery process’ (EDP), which is at the heart of smart specialisation strategies for regional economic transformation. Particular focus in placed on what methods, procedures and institutional conditions are necessary in order to generate information that helps buttress policy decisions. It draws on existing literature that analyses the relevance of EDP within smart specialisation for regional policy. 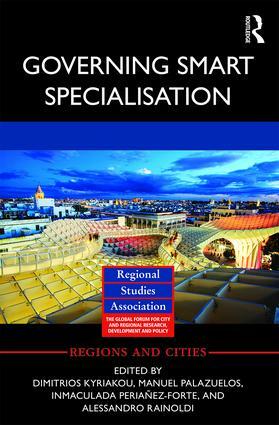 Chapters are complemented with case studies about regions with different geographical and socioeconomic characteristics in Europe: from Norwegian regions to the Greek region of East Macedonia and Thrace. As one of the first books to directly address the EDP, this is essential reading for students interested in regional economics, public policy, urban studies and technology innovation, as well as for policy makers in regional and national administrations. Chapter 1 The Concept of the "Entrepreneurial Discovery Process"
Dimitrios Kyriakou is Senior Analyst of the Knowledge for Growth Unit at the Institute for Prospective Technological Studies Joint Research Centre, European Commission, Spain. Manuel Palazuelos Martínez is Project leader of the Knowledge for Growth Unit at the Institute for Prospective Technological Studies Joint Research Centre, European Commission, Spain. Inmaculada Periáñez-Forte is Scientific Officer of the Knowledge for Growth Unit at the Institute for Prospective Technological Studies Joint Research Centre, European Commission, Spain. Alessandro Rainoldi is Head of the Knowledge for Growth Unit at the Institute for Prospective Technological Studies Joint Research Centre, European Commission, Spain.